The 47-room, seven-story hotel closed on the day it was sold, last Oct. 1, for extensive remodeling. Sporting a fresh new look that highlights its attractive architectural design, the former El Portal hotel in Condado is slated to reopen soon under a new name and new ownership. The 47-room, seven-story hotel closed on the day it was sold, last Oct. 1, for extensive remodeling. Work has yet to be completed but, on a sunny Thursday morning, workers were busy installing the sign proclaiming the hostelry’s new name: The Wave. The new owner is looking to open during the first or second week of April though he has a target date in mind. “April 1 is what we are aiming for,” said Rafael Oller, a former aerospace engineer turned hotelier who acquired the property in partnership with other investors. At the time of the sale, the hotel was doing reasonably well but its owners, a family that had run it for many years, wanted to concentrate on their other businesses and wanted out, according to Oller. The sale price was $2.5 million, he said. His partners in the venture are hotelier Emilio Fournier and Interlink, a leading developer of hotels, resorts, and high-end residential real estate. Oller declined to give details on the partnership but said that the money for the investment is coming from a combination of bank and private financing. The new owners are pumping $1 million in upgrading the facility, which also includes integrating various green, cost-saving features such as new toilet valves for more efficient flushing, water-saving shower heads, and LED lighting. The Wave aims to be the kind of place where tourists will want to recharge, said Oller, who with wife Joyce Oller owns two boutique hotels in old San Juan, Casablanca and Herencia. These old city hostelries, which together have 40 rooms create very special environments aimed at giving guests the unique lodging experience that Oller said many tourists look for when they travel. At Casablanca, with 32 rooms the largest of the two, the lobby recreates an orientalist setting and the hotel features the work of Puerto Rican artist Carlos Mercado. Based in a beautiful colonial home, Herencia creates an exuberant environment by mixing old world furnishings with modern art. According to Oller, The Wave is “not about art, or flashiness. It’s about relaxation.” To achieve this, the management opted for a cool, blue and white color scheme that is bright and airy as well as evocative of Puerto Rico’s sea and sky. These two colors also enhance the building’s facades: by painting the sun shading projections (brise-soleils) on the facades in different shades of blue, the building’s grid design is made to stand out. A triangular canopy above the entrance of the hotel and the windows on the ground floor suggests the waves of the ocean, hence the new name for the hotel. As the opening date draws near, there is still plenty to be done. For example, a restaurant concession that was to occupy a 1,600-square-foot space on the ground floor fell through and a replacement needs to be found. Oller said he has received proposals for different Asiatic-style restaurants but there is nothing definite yet. Meanwhile, work continues on the hotel’s rooftop where a sun deck is currently under construction and the bar is being expanded. The rooftop, with sweeping views of Condado Lagoon and the cityscape, also will feature a jacuzzi. The Wave will be marketed through social media and major travel sites such as Trip Advisor, Hotels.com, Expedia. It will have a staff of 15 people. Oller said he left his aerospace engineering job at Pratt and Whitney in Hartford, Connecticut, because he wanted to return to Puerto Rico and saw opportunity in the tourism business. “I believe in Puerto Rico’s tourism potential,” he said. Hey Buddy!, I found this information for you: "Fresh new start for El Portal Hotel in Condado". 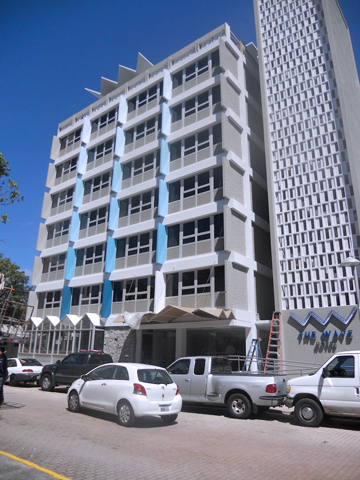 Here is the website link: https://newsismybusiness.com/fresh-new-start-for-el-portal-hotel-in-condado/. Thank you.